The accusations, which include claims of alcohol and drug abuse, appeared Monday evening in a new investigation by Jane Mayer and Ronan Farrow of the New Yorker. 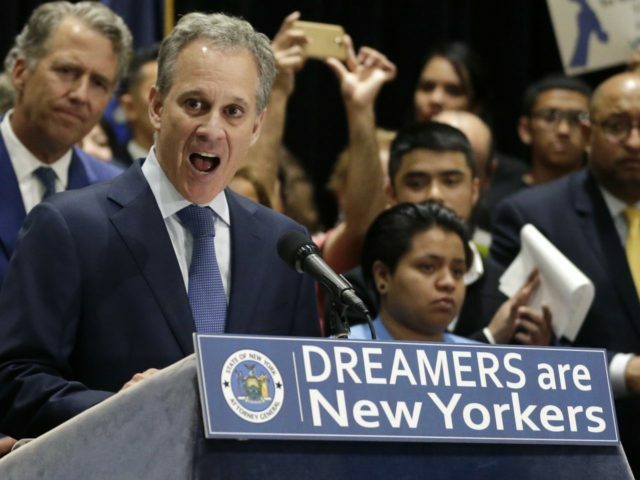 Within just a few hours, New York Governor Andrew Cuomo and Sen. Kirsten Gillibrand (D-NY) called for Schneiderman’s resignation, and a short while later he complied. The four women — two of whom allowed their names to be used — described a pattern of abuse that had little to do with “role-playing and other consensual sexual activity,” as Schneiderman described the encounters in denying their claims. His supporters were left struggling to square the public persona he adopted with the alleged private behavior that Mayer and Farrow had exposed. One observer who was not surprised was President Donald Trump, who predicted Schneiderman’s downfall in a 2013 tweet: “[Anthony] Weiner is gone, [Eric] Spitzer is gone – next will be lightweight A.G. Eric Schneiderman. Is he a crook? Wait and see, worse than Spitzer or Weiner”. Trump often found himself in Schneiderman’s crosshairs — first in the Trump University fraud lawsuit, then in a barrage of lawsuits against Trump administration policies. Schneiderman was also reportedly working with Special Counsel Robert Mueller in his pursuit of Trump campaign associates, tangential to his original mandate to find Russian collusion. And Democrats who worried that Trump might pardon some of his former allies — many of whom are from New York — put their faith in Schneiderman, whom they hoped would pursue Trump associates under state law (which is not covered by presidential pardons). The former New York Attorney General made plenty of other enemies, too — usually pursuing Republicans while sparing Democrats. He targeted former AIG CEO Hank Greenberg, for example, but left former MF Global head Jon Corzine alone. He also went after conservative tax-exempt organizations — but left liberal groups alone, much like the IRS. Now he is done — and the most remarkable thing is that it was the leftist New Yorker that did him in.